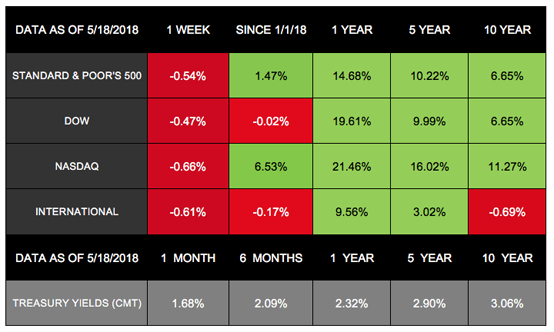 Major domestic indexes went down last week after all three gained more than 2% the previous week. The S&P 500 dropped 0.54%, the Dow gave back 0.47%, and the NASDAQ lost 0.66%. International stocks also stumbled; the MSCI EAFE decreased by 0.61%. Two familiar topics were on many investors' minds last week: trade and treasuries. Here is a recap of the key details and their market impacts. Tension between the world's 2 largest economies continued last week as the U.S. and China launched another round of trade discussions. Both countries have threatened billions of dollars of tariffs on the other's products, but so far, neither has acted. On Saturday, May 19, the countries released a joint statement saying they would take measures to "substantially reduce the United States' trade deficit in goods with China." The Chinese state media called the agreement a "win-win." Then on Sunday, May 20, U.S. Treasury Secretary Steven Mnuchin announced that they had "put the tariffs on hold." The weekend's developments imply both countries will continue working to close the trade deficit by increasing China's imports of U.S. agricultural commodities and energy. As the trade talks unfolded on Thursday and Friday, investors received very little information. This uncertainty affected investor sentiment and contributed to stocks ending lower on Friday. Now that the countries have shared some details about the negotiations, we will focus on how investors digest the news in next week's trading. Mnuchin's assertion that the trade war is on hold for now should be welcome news for investors. The 10-year Treasury yield closed at 3% or higher every day last week. Early Friday, it reached its highest point in almost 7 years as data continued to demonstrate the labor market's strength. We learned last week that the number of people receiving jobless benefits is at its lowest since 1973. Unemployment is also currently at an almost 17-year low. The numbers suggest the economy is likely reaching full employment. So, how does labor data affect Treasuries? Typically, employers have to pay higher wages when unemployment is low. As wages increase, other prices in the economy often rise, which can trigger inflation. This can cause Treasury prices to suffer as their fixed payments become less valuable, causing yields to rise. Treasury yields affect markets in a variety of ways. When they increase quickly, concerns can arise that the economy is accelerating too fast, which can cause the Federal Reserve to raise interest rates. In addition, for 10-year Treasuries, yields above 3% are a psychological benchmark. Some people believe stocks become less appealing when Treasuries can provide this level of income. For now, we will continue to analyze whether yield increases are a sign of a strengthening economy or rising inflation rates. We know that trade disputes and Treasury yields are complex, constantly changing topics. So, if you have questions about how these details affect your financial life, we are here to talk.